Vicki Hardiman and Joni Crenshaw are creative sisters that I met years ago when we started our first magazine Just CrossStitch. They designed some of the most beautiful samplers to cross-stitch that were available back in the 1980s. Today Vicki has pioneered another wonderful business, Simply Grace, with unique dresses for little girls. When my first granddaughter was born, Vicki sent me a wonderful dress for her, and I fell in love with her dresses and the creative uses of trims, buttons, and ribbons. 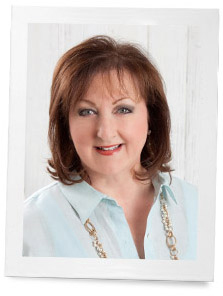 I had a chance to visit with Vicki and wanted to share her story in hopes that you will be inspired by her vision and fall in love with her dresses. PLUS: you can enter to win a Simply Grace dress! Here is Vicki’s story: My sister, Joni, and I always felt we would like to do something with children’s clothing, and our children, and now my grandchildren, inspired us to go forward. 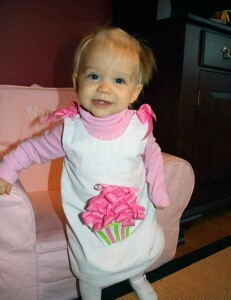 The final impetus for starting was designing a first birthday dress for my granddaughter. My daughter wanted a dress with an appliqué to match the party invitation, but we realized that she would only wear it once or twice. I decided to try to make one and, after a suggestion by my mother, I made the appliqué removable, and our first Poppet dress was born. Wanting to get the most out of my efforts, I made the dress reversible. Our name is Simply Grace because we feel that any success we may have is very simply…grace. Any talents or abilities we have, we credit to blessings from God. And certainly the children who have inspired us have been gifts! The garments are all reversible and changeable. The Poppets dresses have removable and interchangeable appliqués, which fit any size dress as your child grows. The appliqués button on so that a birthday dress can become a Halloween, Thanksgiving, or everyday dress in a blink! The Ribbons and Curls dress is also reversible and can be changed with additional ribbon sets. The bows are pre-tied and button-on so you don’t have to struggle with a wiggly little girl as you work up a sweat tying a pretty bow! I am the designer of the dresses, but as you can tell by my previous answers, ideas have been a group effort! My mother, sister, and daughters have been tremendous supporters and have contributed so much creatively, including the design of our logo and a pre-launch contest video. We love designing but find it has been difficult reaching our target market. We have started small and are on a tight budget so we are using social media to try to get our designs out there. 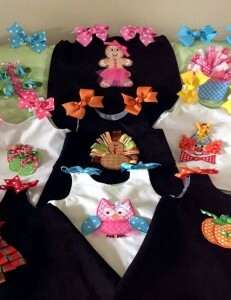 We have a Facebook store where the dresses can be purchased www.facebook.com/designsbysimplygrace. Our Ribbons and Curls dress in college colors has become a tailgate favorite. They have a classic look to replace those little polyester cheerleader dresses sold in college bookstores! With a change from a red ribbon set to an orange one on our black corduroy/hounds tooth dress, you can go from Roll Tide to Happy Halloween. We hope to have an e-commerce (real) website soon. We have so many designs we would love to manufacture including a ladies’ dress which would also be changeable and little boys’ outfits with removable appliqués. I think starting a business requires patience and the desire to learn. I continue to realize how much I don’t know! It is a very slow process and can sometimes be disheartening when things don’t happen as you anticipated. The 1-year-old granddaughter who needed the birthday dress was almost 5 as we went into production and has now outgrown our sizes as an almost 6-year-old! I love her story and am so excited to tell you that Vicki is giving away one of her fabulous creations: a navy blue corduroy reversible jumper with two sets of ribbons and bows! Sign up for our newsletter below to be entered to win this beautiful dress. One lucky young lady will be sporting a Simply Grace dress this fall! I want to say that I truly pray you are blessed as it is past time for mother’s towear dresses themselves and what better way to have wonderful future mother’s than their memories of enjoying wearing dresses as their earliest memories. If we are what we eat than does this not apply to how we dress? Something to think about. May your business be a blessing to young mothers who wish to dress their daughters as girls with buttons and bows. Love to win one for a great-granddaughter. 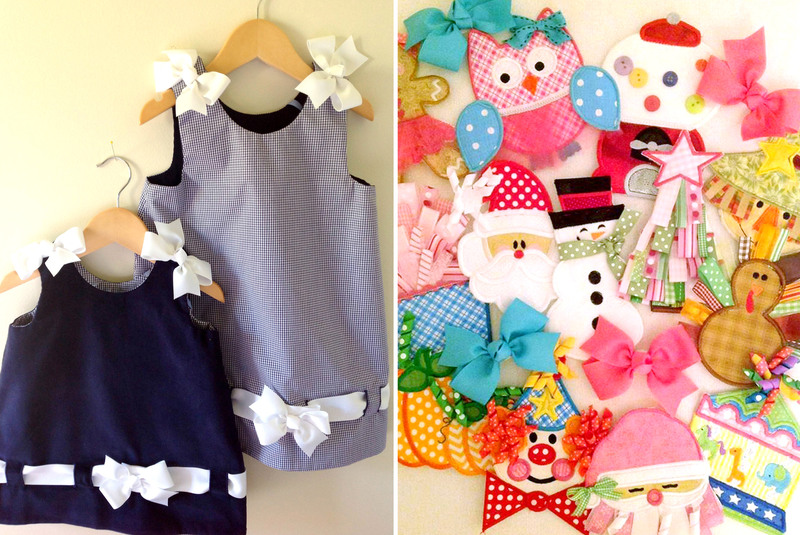 These dresses are absolutely adorable…and what a unique idea…congratulations!! Hoping you plan to offer larger sizes soon. My granddaughter will be starting kindergarten this fall and I would love for her to have one of your adorable dresses. Another graceful business comprised of gracious ladies who love and serve the Lord! Your business sounds like a labor of love. God’s blessing to you! Soooo cute, what a great idea.